If there's one thing the Xbox 360 hasn't lacked, even at its launch last year, is racing games. And until now, "drivers" have lacked a proper way to take their cars at extremely ridiculous speeds, relying on the decent, if flawed for driving, Xbox 360 controller. 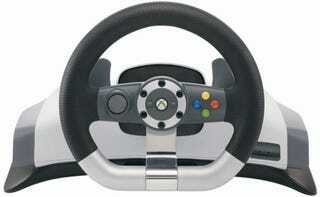 But the Wireless Racing Wheel's set to change all that, as long as your racing game is "officially" supported. In their test, Xbox Candadian found that PGR3 performed admirably, with the wheel resting solidly on their laps and the pedals being firmly mounted thanks to the ankle-hole design. Other unsupported games like Test Drive Unlimited and Need for Speed Most Wanted had varying degrees of force feedback and success, but they were playable. Newer games like Need for Speed Carbon and the upcoming Forza 2 should offer some even better support.